A toy you simply love is not working? Maybe it has a corroded battery in it? You need not chuck it into the trash just yet. We'll tell you why this happens and how you can still save your favorite toy. The ancient Parthian civilization used batteries 2,000 years ago! They were used to electroplate gold on silver articles. The batteries used in toys send electrical energy through the terminals and make the toy work. However, when they corrode, an insulation layer of debris is formed between the battery and its terminals, thus blocking the path of the current and preventing the toy from working. This can also damage any other electronic parts of the toy, if left unattended for some period of time. Sometimes, the terminals themselves are corroded and need to be removed. Despite all of this, the toy can still be salvaged, with just a few simple steps. So instead of simply tossing it into the trash, here is what all you can do to get it up and running, just like new. What Causes Battery Corrosion in Toys? ➥ Not removing the batteries when storing the toy away for a long span of time. ➥ Storing the gadget in a damp place. ➥ Exposed to extreme heat or cold. ➥ Using different batteries of different brands/age/types. ➥ Using batteries that have been damaged previously/not checking the batteries for damage prior to use. ➥ Attempting to recharge a disposable battery. ➥ Corrosion of the battery casing due to humidity may cause the chemicals to leak out, damaging the terminals and equipment. ➥ Collection of hydrogen gas inside the battery will break the outer casing or the insulating seals, causing a leakage and subsequent corrosion. ❑ First and foremost, put on a pair of protective gloves and eye glasses. First try to remove it by vigorously shaking the toy. If that doesn't work, try to pry it out using a screwdriver. If that too doesn't work, pour some Coca Cola on the battery and try again after sometime. ❑ Clean the battery compartment using a toothbrush or paper towel to remove as much of the debris as you can. ❑ Find out whether the battery is alkaline or acidic. ❑ If the battery is alkaline, dip a toothbrush or cotton swab in some vinegar or lemon juice. If the battery is acidic, then use a paste of 2 tablespoons of baking soda in some water. You can also mix 1 teaspoon of baking soda in 1 cup of water for the paste. ❑ Apply the paste or liquid carefully on the corroded terminals, and keep it away for a couple of minutes to neutralize the leakage. Alternatively, just sprinkle some baking soda on the terminals, and use a damp toothbrush/swab to clean them. The fizzing is an indication that the leakage is getting neutralized. ❑ Using a toothbrush, gently remove the baking soda/vinegar/lemon juice. It will also remove some of the remaining corroded material. Let the terminals dry. ❑ If the above steps don't work, you can try cleaning the terminals with a cotton swab dipped in rubbing alcohol. ❑ Using a wire brush/nail file/light sandpaper, gently rub the terminals to remove the corroded particles completely. ❑ Using a barely damp cotton swab, wipe the battery compartment till it is clean. Then wipe with a dry paper towel. ❑ Allow it to air-dry before use. ❑ Then, just insert new batteries, and you are good to go! ❑ If the battery corrosion had extended to one of the spring terminals, causing it to break during the cleanup, you can still fix the toy. Just make an appropriate-sized wedge of aluminum foil and insert it in the gap between the battery and the terminal. Now put in some new batteries. Contrary to popular belief, battery corrosion in toys, in most cases, is something that can be rectified. 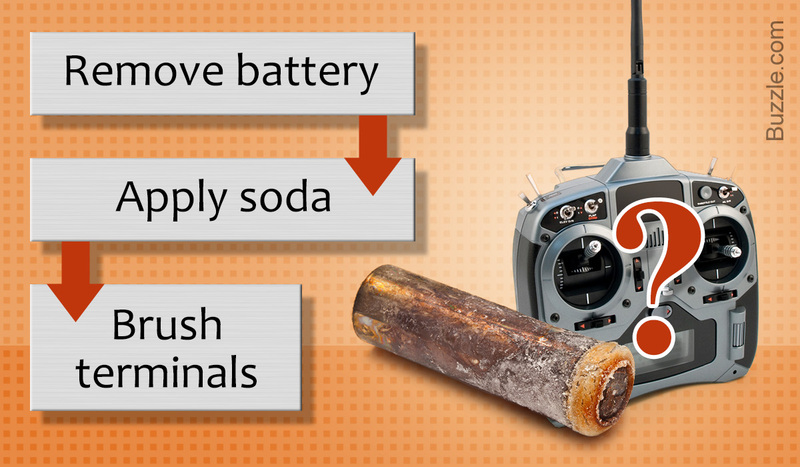 With these simple steps, you can fix your toy, remote control, or even a flashlight that has corroded batteries in it. Never touch the corroded stuff in and around the battery compartment with your bare hands, as it may cause burns or infection. Avoid any eye contact with the corroded material, or even ingestion.